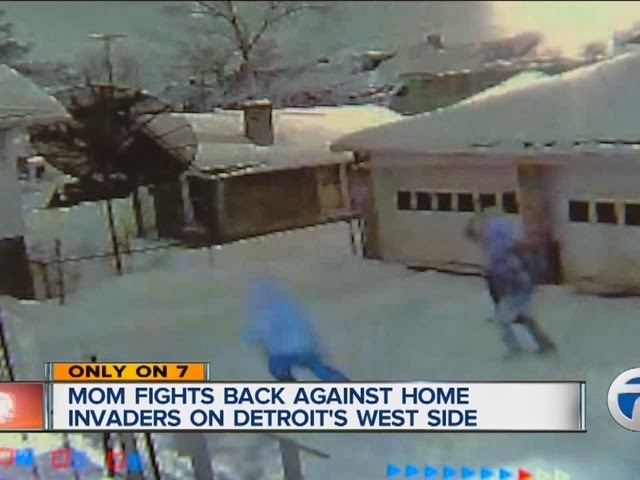 A Detroit mother opened fire Monday night when three suspects broke into her home. Surveillance cameras caught it all.The mother tells 7 Action News she "didn't have time to get scared." When she heard the door to her home on Woodrow Wilson being kicked in, she immediately warned the three teenage intruders and then opened fire. One of the teens dropped a handgun on his way out the door. He then tried to get back inside the house a second time, but was again met with gunfire. Once again, he took off and all three were arrested shortly after the incident by Detroit Police. These young criminals were indeed fortunate that they were not killed as they tried to break into this woman's home. Although incidents like this may indeed be statistically rare if you are the person confronted with this behavior that's small comfort indeed. Notice that the woman defended herself and her children with a scary looking "assault rifle". Unfortunately there are people in this world who are "bad", "warped", "bent", "evil" or whatever other pejorative word you wish to use. Ultimately I suppose you could pity such people but in my view such pity can only be doled out once they're safely behind bars or six feet under the ground. If one happens to be unfortunate enough to run into such miscreants bent on taking something that is yours, immediate and massive counter force is the only thing which they will respect. Incidents like this are why I am unsympathetic to people who tell us we don't "need" guns to protect ourselves or that no one "needs" a magazine capacity with more than an arbitrary number of rounds. As far as I am concerned the only bad thing about this incident was that the mother didn't light up all of the home invaders. Please note that although the police arrived quickly after the fact and arrested the criminals it was impossible for the police to be there at the moment that the thugs decided to break down the door. We are ultimately responsible for protecting ourselves and those we love. Watch video here.